There are some mythical answers that I hear from time to time. Never quite understood where they came from. Among them: there were four original founders, all tango dancers; Tango was a dog that had four puppies; I have had another company called Disco/03 that went belly up; I saw Elvis in a small town bar and he gave me the name. There are some more but they are a bit less credible. A great explanation is that the name refers to the dance among four stakeholders (say, employees, partners, customers and their companies), and I like it a lot. I´ve even mentioned this one in some interviews when questions got really boring. But, nice as it is, it is in the best case an afterthought. The original Tango/04 was the presidential plane in my mother country, Argentina. Think Air Force One. In fact, military planes used for transport (I mean, not bombing) are named “Tango” and “a number.” This was transport number four and it was famous because it was used for presidential journeys in the eighties. I was at home trying to launch my first software company and scratching my head over the name. As the initial plan was to sell software to IBM AS/400 customers, I was lured towards a name with a slash and the number four hundred. How about “Tango/400”? After all, I was born in Buenos Aires, id est, Tangoland. However, I was sure that the company could change its target market in the future, or that IBM could rename their midrange system. Lucky me, for both things actually happened, and faster than I thought. So, I opted for an intermediate approach (inspired by the German soccer team Schalke 04), using the slash and the numbers that appear in 400, but varying it a bit, and “Tango/04” was born. But later on I realized why Tango/04 was really named this way. Unconsciously, I had put in the name one of my firm professional beliefs: software creation is not purely a mathematical process, nor is it purely an artistic process. It is a combination of both. 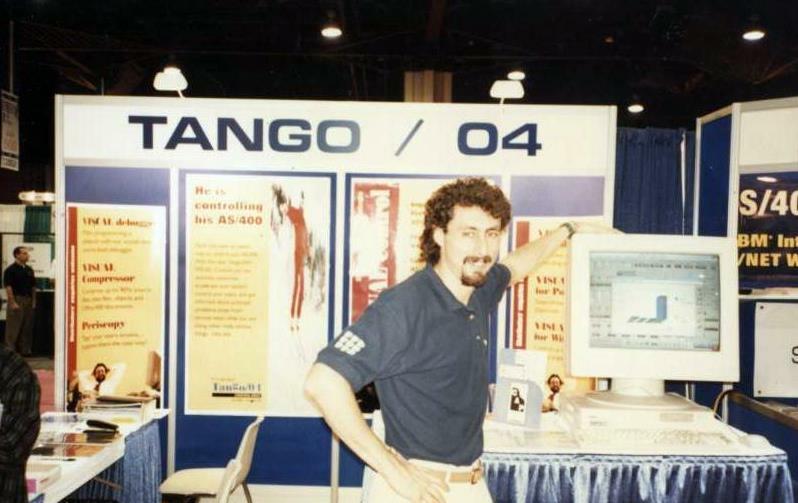 “Tango/04” is a name of a dance and a musical genre (the artistic part) and two numbers (the mathematical part), so, as for naming a software company, it turned out to be the perfect way to communicate this belief. And Barcelona/04? Well, our regional branch in South America needed a different name (“Tango” was already trademarked there) so it inherited the “slash zero four” and the name of the city of its headquarters. If you think about Barcelona as a great example of an “open museum,” with its outstanding modernist architecture, then the combination of beauty and creativeness and engineering is also present in the name. This entry was posted in Humor, Non-IT, Ramblings, Tango/04 by RCA. Bookmark the permalink. Not bad Raul!! The explanation is perfect.